I haven't tried Zoella's products before and I kind of wanted to see what all the fuss was about. And I have to say whilst a couple of the products I wasn't overly impressed with, there was other products that were the best I've ever used! Just to let you know, a bath bomb is also included in the range but I don't have a bath to review that product unfortunately! So without further ado, here's my review of Zoella's new Tutti Fruity range. The first time I applied the body lotion I found it rather sticky, there was no luxurious moisturisation about it. I wore it to bed and my skin still felt sticky the next morning. I found it didn't really smell as fruity as it makes out either. So my first try wasn't very impressive. However for some reason the second time I tried it, I felt less sticky and the fruity smell came out a bit more. I'm someone who suffers with very dry skin so I probably won't make a habit of using it as I feel this product is more about the smell and texture more than anything. It also has little beads of acai and blueberry which can make it feel like a body scrub but these do absorb into the skin once applied. Anything pink immediately gets my attention! I applied the shower gel after using the body scrub so my skin was nice and smooth. As you're rubbing it in, the solution produces lovely bubbles (hence the name!) so you feel all girly when using it! Although I did enjoy using the product, it doesn't really stand out for me but I would recommend it if you're in need a little girly pamper. I love to carry around a body mist when I'm out and about to make me feel instantly refreshed! This body mist is sweet, floral and fresh (3 of my fave scents)! The smell lingers for a while after too which is great as there is nothing worse than not being able to smell it after 2 minutes. 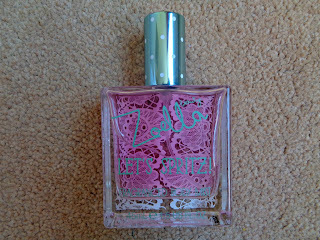 The bottle is super cute and again, the mist is pink!! It's small enough to fit in your handbag which is handy, however too big to fit in the cosmetic purse. Oh my god, literally the BEST body scrub I have ever used!!!! IT smells amaaaazing and my skin felt so luxuriously soft afterwards. I just rubbed it in using my hands (no exfoliating gloves) which didn't irritate my skin making it ideal for sensitive skin. The scrub feels like a paste and rubs in gently and easily. This is my favourite product from the whole range - I will use this to death! I'm afraid to say that the lip balm was my least favourite of the collection. Firstly I found it difficult to even get my finger in the pot (I guess my long nails didn't help with this and a lip brush would probably come in handy). 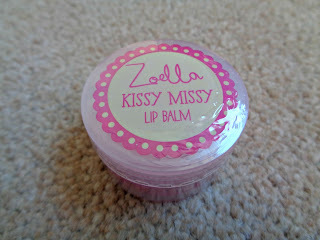 The balm itself smells a bit cakey - nothing fruity about it. And the colour in the pot is stronger than the colour that appears on your lips. Saying that it still does give a nice subtle candy pink shade. Once applied the colour only lasted about an hour. It was all a bit of a fuss for me so unfortunately I have to say I won't be using this product again. It's a cute and girly design but very small and to be honest you can't fit much in it at all. I couldn't even fit my foundation in there! I think it would be nice as a pencil case though. I definitely feel this is a purse designed for Zoella's younger following but I do appreciate that it is very cute! 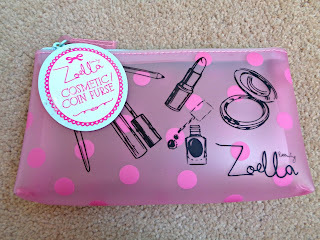 Have you tried Zoella's products? If so let me know your thoughts! I love the packaging of the products! sounds like the body scrub is a winner. Yes her packaging is so cute! The body scrub is definitely a winner for me! It's so nice to read an honest review of a beauty bloggers range. All too often, people jump on the hype just because of whose product it it. Definitely! Glad you liked my review. I wanted to be honest. 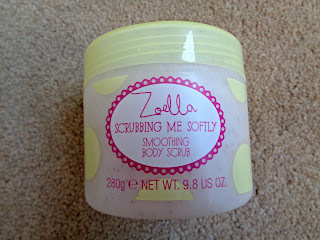 I do love Zoella and some of these products are great but was equally disappointed with some others! Love your honesty in this review! I'm far more likely to value the opinion of someone who doesn't mind saying whether they dislike a product and it means when they say something is good I'm far more likely to believe them and buy it!! I've only recently started all this and didn't see these products not too long ago, its good you've done such an honest review about these products, if I carry on seeing honest reviews I might have to purchase the mist itself as I do love one to carry in my handbag!